Physical tickets will NOT be mailed out until April 15, 2019. Online tickets may NOT be picked up at the merchants! Garden Day's Preview Party, An Evening in the Garden, is in its 10th year - and more grand than ever! 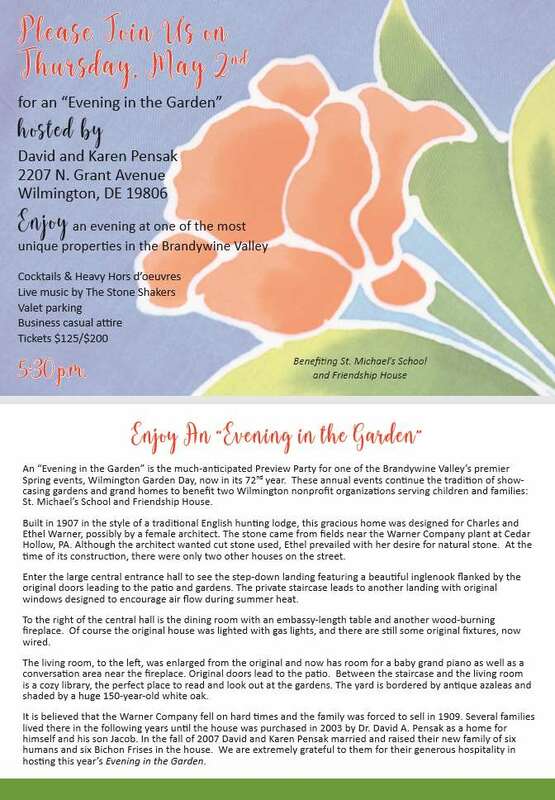 We hope you will join us to celebrate a treasured tradition in one of Wilmington's most unique and historic homesteads. Children under 12 are free, if accompanied by an adult. *Tickets with Map & Guide Books will be mailed to those who order before April 27, 2019. Physical tickets will NOT be mailed out until April 15, 2019. Online tickets may NOT be picked up at the merchants. Tickets ordered after April 27, must be picked up at Janssen's Market, 3801 Kennett Pike, Greenville, DE. May 4, 2019 - Tickets will be available at Janssen's Market, 3801 Kennett Pike, Greenville, DE from 8 AM to noon.